The wildlife park shared a video of the pair as the tiger chased the duck around a pool in the tiger sanctuary. “This wild duck would have to be the bravest duck that ever lived,” the wildlife park wrote on its Facebook page. 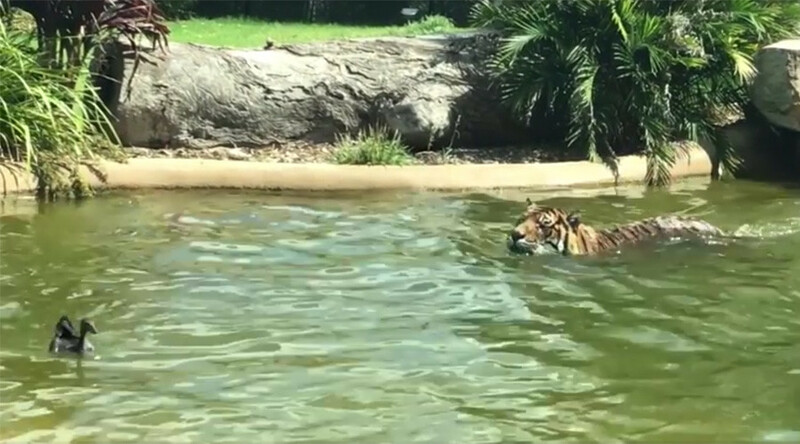 Jalur, the 126kg (278 lbs) Sumatran tiger, tried his best to catch the little duck, but it managed to dive underwater to avoid the big cat, who looked confused at the duck’s disappearance. “Now I know where ‘duck duck goose’ came from,” one commenter joked. Eventually, Jalur gave up and leaped onto the rocks, leaving the duck to have the last laugh, as a crowd of onlookers cheered. “That's one smart duck, a pleasure to watch,” said another.